Baby Tommys crochet snooze cozy-hat, just the pattern for grandma to make for the new family member, baby will look so cute and snug. Made in a one row pattern of a close textured combo stitch for warmth. See my free Easy Peasy Baby Cardi and Woodland Coat crochet patterns. Snooze Cozy – Made in rounds without turning until the end of 6th Row. 6th Row – (Inc) ch3, 1dc in base of ch3, 1dc in each of next 4dc, * 2dc in next dc, 1dc in each of next 4dc, * rpt from * to * to end, sl st to top of ch3 on beginning of row. 8th Row – ch1, (1sc, 1hdc, 1dc) in base of ch1, * skip 2st, (1sc, 1hdc, 1dc) in next sc, * rpt from * to * to last st, skip 2st, sl st to first sc on beginning of row. Turn. Rpt 8th Row until 53 rows have been worked from beginning or work measures approx 16 Inches. Turn. Collar – Working in back loop of stitch only ch1, work 1sc in base of ch1, 1sc in each sc to end, sl st to first sc on beginning of row. Turn. 56th Row – Work through both loops of stitch from now on, ch1, 1sc in base of ch1, 1sc in each sc to end, sl st to first sc on beginning of row. Turn. Rpt last row once. Fasten off. Turn. Join in color 2 and rpt last row seven times. Fasten off. Turn. Join in color 1 and rpt last row twice. Fasten off Turn. Finishing – Weave and trim of any loose ends of yarn, fold collar on to front of pocket. Hat – Made in rounds without turning to the end of Row 14. Row 7 to 13 – ch3, 1dc in each dc to end, sl st to the top of ch3 on the beginning of row. Brim – Working in back loop of stitch only ch1, work 1sc in base of ch1, 1sc in each sc to end, sl st to first sc on beginning of row. Turn. Row 16 – Work through both loops of stitch from now on, ch1, 1sc in base of ch1, 1sc in each sc to end, sl st to first sc. Fasten off. Turn. Join in color 2 and rpt Row 16 three times. Fasten off. Turn. Join in color 1 and rpt Row 16 twice. Fasten off. Turn. Finishing – Weave and trim of any loose ends of yarn, fold brim on to front of hat. Hope you enjoy baby tommys crochet snooze cozy-hat pattern, there will be more free baby crochet patterns coming for Tommy soon. The written instructions and pictures for baby tommys crochet snooze cozy-hat pattern are copyrighted to crochet ‘n’ create © 2018. 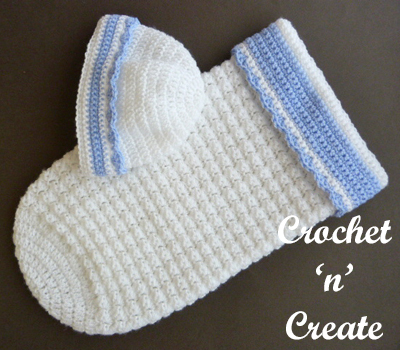 You are welcome to sell the finished products made from the free baby tommys crochet snooze cozy-hat pattern, I just ask that you use your own pictures and put a link back to crochet ‘n’ create. 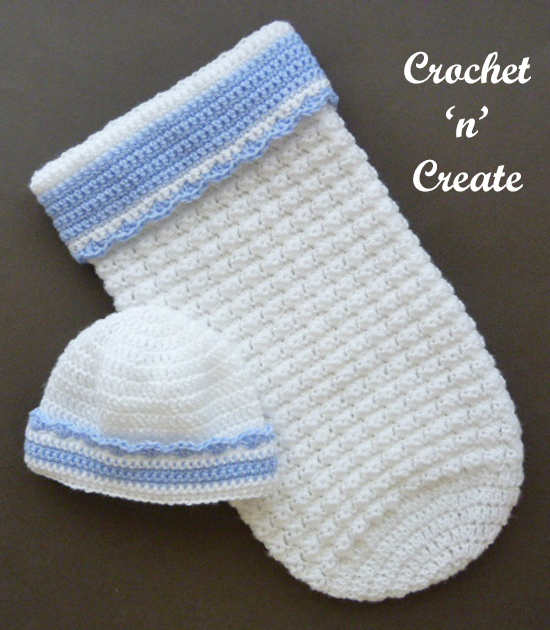 If you wish to tell your friends and followers about this pattern, please only use a direct link to the pattern page on crochet ‘n’ create. DO NOT share the written instructions for baby tommys crochet snooze cozy-hat pattern. 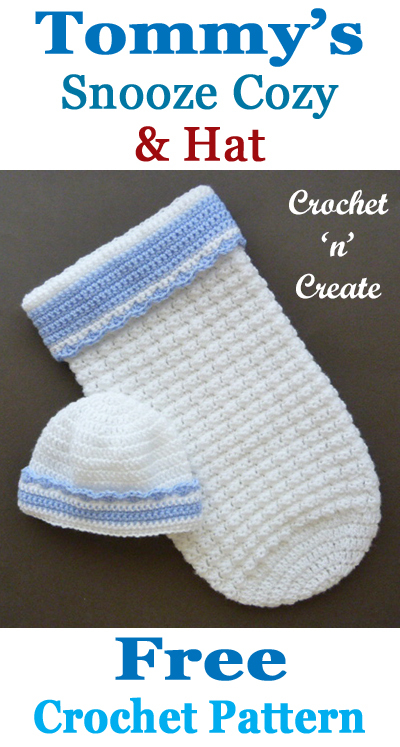 This entry was posted in Baby crochet pattern and tagged baby boy, baby crochet patterns, crochet, crochet cozy on 28th June 2018 by crochetncreate.